Did you know that in statistics they have a random number chart. This really just cracks me up. Seriously the irony just makes me giggle! Anyways, I went to the doctor today to have my iron levels checked again. So for those of you that don't know I went to the doctor about 3 weeks ago, which I never do by the way, to see why I was so very tired, dizzy every time I changed altitude even by a little bit, couldn't run, and just felt like dookey in general. My iron levels were at 9. All other blood work came back looking great. So instead of taking the supplements I decided to try and get my levels up through my diet. I am my own experiment of one so why not. I have been eating red meat, which is getting kind of old. I don't mind and actually like venison but I don't have a source of that right not so its been beef. 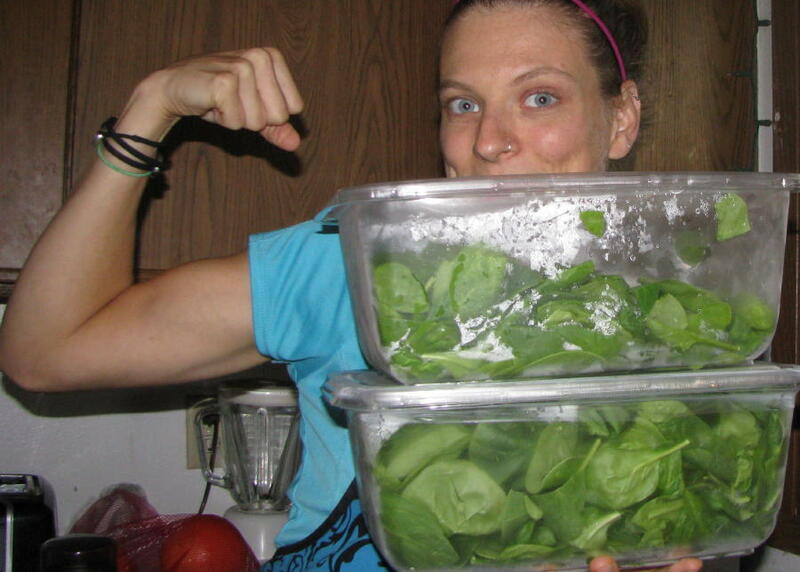 I eat chocolate and loads of spinach, hummus, raisins, and anything else with iron in it. I also eat tomatoes and fruit for vitamin C to help absorb the iron. I replied to a comment about my spinach photos saying that I was in the christmas season spirit with my red skin from all the tomatoes and green poo from all the spinach. The line for TMI is pretty far out there after becoming a mother. Being a mother and a runner makes it doubly so. I feel so much better after my diet change! I even got in a 15.84 barefoot long run in on Sunday and have had a couple 3ish milers with Jaymon. When I got my results back from the doctor today we were both surprised that my numbers had dropped even lower. What the bloody hell is that all about???? It is now at 8.5. So I am conceding to taking the supplements of which he gave me a prescription for. I asked why I felt so much better and yet my number dropped and he said the body can adapt. 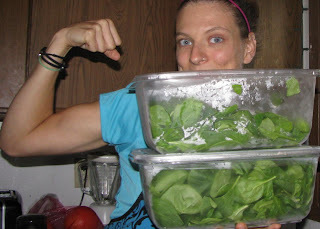 Now its loads of spinach, hummus, tomatoes, chocolate, red meat, and iron and vitamin C supplements three times a day. Cool with me. I feel better so this will hopefully only keep on making me feel even better yet. I get to work the New Belgium Brewing Urban Assault Ride on Sunday here in Des Moines. Come and see me at Mullets. I will be at the nuun tent! I am not part of the bike/cycling scene here in Des Moines so I am looking forward to meeting new people and seeing what kind of fun they have. We are headed to Iowa City tomorrow for Dentist appointments. Should be a fun little road trip although Jupiter may not think so as he is having his space maintainers taken out. Its so hard to try and explain what is happening to a non verbal boy with autism. He is tough and adapts pretty well considering and we will all be there for him. Jupiter also starts the school year at Smouse Opportunity School next week. Its a beautiful building and has a therapy pool and lots of sensory opportunities. I feel good about the change and I think he will really enjoy it. My son Samson is in 5th grade this year. He is homeschooled and we are a part of the Des Moines public school systems home instruction program. Milo and Archimedes will be doing some school work this year as well. I have an 18 mile long run planned for either Friday or Saturday. It was supposed to be Sunday however I am working so need to switch days. I have been working on core strength and going to do P90X yoga today and Chest and Back tomorrow. My focus is on the long run since my marathon training is an experiment and has been turned a bit wonky from the anemia. I am loving the runs I get to do with the hubs again! His knee is feeling great and we are able to run a few miles at a time together. 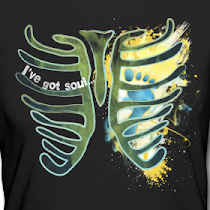 Don't forget to check out my Snorg Tees Giveaway and also check out my sidebar list of giveaway out in the blogsphere. There are many good ones going on now! How is life going with fall coming? Marathon training? Any other race training? Are you ready for school to start back up? How are you going to cope with the winter this year? Laughing...the line for TMI is definitely far out there after having my 3 kids! I just wanted to mention that my husband is a physician who used to be a chiropractor, so he knew about a kind of iron called chelated iron that is supposed to be better. I take that. I'm not sure why it's better, but I'll ask him if you want. Don't know you well enough yet, since I just started reading your blog, to know if that would be of interest to you or not to explore. Just putting it there in case it's helpful. just had to swing by and say I LOVED your creativity juices flowin on my post! woo-hoo! that's so weird that the number went down! I'm gearing up for a busy fall too...I'll think of you on your 18 miler while I'm doing my 21 miler this weekend!! Oh, Angie, they must have made a mistake. See, I am one of those people who, if only possible, would like to avoid supplements. I would love to believe that we can get what we need from our food. OK, OK, this is what I would like. The reality often is different. BTW, some people swear cast iron pans help with iron levels. Now I love my cast iron pots and pans but I am not sure how much iron I am really getting from them. Hope your anemia goes away with whatever iron form you take. Hi Angie, I found your blog through the Run Like A Mother site and I can so relate to both the anemia and having a child on the autism spectrum. My son (age 14) has Asperger Syndrome and is high-functioning and verbal but he definitely has his challenges, especially in school. It has gotten easier as he's gotten older but it hasn't gotten EASY. He is definitely worth all the struggle, though, as I know your little guy is, too! On the anemia, I have been anemic or borderline anemic all my life (I'm 43) and finally found out several years ago that my body just cannot utilize non-heme iron. So all that plant iron I've always tried to get into me did me no good! I have to get all my iron from meat, which brings up all sorts of ethical stuff with me (I used to be vegetarian, that's how I found out about the heme/non-heme iron issue) so I'm always experimenting to see how little meat I can get away with and not get sick. That anemia fatigue is like no other fatigue, though, so I really feel for you and hope your levels get up soon so you can feel better! Well, sorry for writing a novel in your comments but I didn't want to lurk anymore. 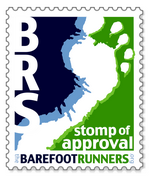 Love your blog and am very intrigued with the barefoot running! I'm anemic and have been for a few months now. I was actually *severely* anemic at diagnosis and had my iron levels been slightly lower, most likely would've had to have a transfusion. All my other numbers were low too- the ONLY thing that was normal in my CBC was my WBC count. I was put on a supplement called Bifera, which has been working pretty well. It's a combination of heme and non-heme iron, so if you have to do a supplement, it's supposed to be one of the best ones. Otherwise... it seems like you're doing well. The Vitamin C helps too. Maybe when your levels go up, you can stop the supplements. I mean, I'm not too keen on taking them either, but I look at it just like taking an antibiotic or another medicine- you won't be on them forever, it's just to get you better so that you don't have to be on them :). Have fun on your long run! Sorry the natural way didn't do the job...I do hope that you won't have to take supplements for too long. Things sure sound hectic for you these days...stay strong and hope you keep on feeling better! Dumb question but what is a normal iron level and is it x per 1000? Hoping your anemia improves! Sounds like you're doing what you need to do. It's awesome you were able to feel better with a change in diet too! Has anybpdy reminded you to stop drinking tea, if you usually do ? Tea will inhibit the absorption of iron. Sorry about your iron! CRAP! Please take care. New Belgium is awesome. They use their powers for good. I've been inspired to answer your questions on my blog..
Hope the supplements improve your iron levels soon. Glad you are at least feeling better. LOL at the TMI line - mine only exists because my husband gets embarrassed by some of the things I'd be willing to share. That's so odd that you're feeling so much better and the count dropped. I guess the good thing is after the supplements kick in you'll feel even more fantastic!